A month has passed and I have to leave my beloved archipelago in the deep blue Mediterranean Sea behind. 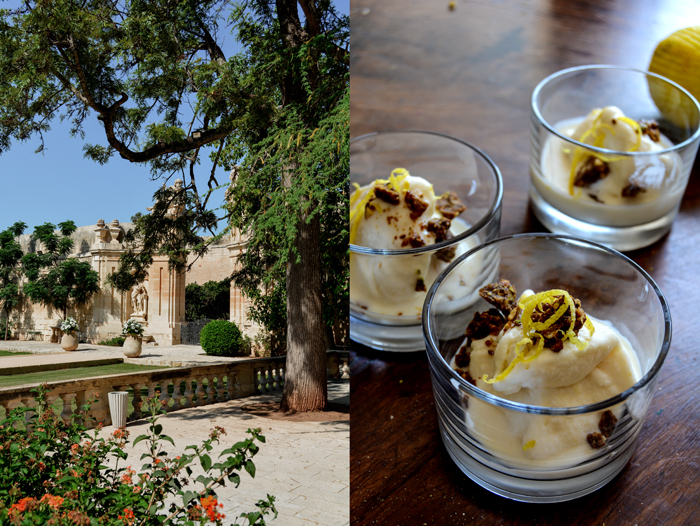 This is the last recipe from my Maltese summer, but I’ll be back soon, in October, to present my ‘baby’ at one of my book launch events, at the fabulous Villa Bologna in Attard. It’s been a summer full of emotions, with lots of work during the day and family gatherings or evening swims afterwards – the fun began as soon I closed my laptop and put my phone aside. I’ve been busy organizing the book launches in Europe and the US, I survived my first interviews and photo shoots and I met so many wonderful people who’ll be helping me over the next few months. To my surprise, I’ve been enjoying everything that comes along with being a cookbook author. I love giving interviews (I love talking!) and I’ve been quite lucky, I’ve only met very interesting and entertaining people to talk to so far. Photo shoots are still a bit challenging for me, I prefer to stay behind the camera. Usually, I ask my man to accompany me, he manages to make me laugh in the weirdest situations – the result is that we have lots of photos with a big smile on my face. We had a fun shoot with my friend, the great photographer Luke Engerer in Malta. He put me on the roof terrace of his house, the sea in front of me, sparkling in the light of the sinking sun. It was so amazing that I didn’t even mind getting naked on the roof to change (I just hope that none of the neighbours had a camera at hand). The problem with such a busy schedule is that time flies even quicker. It feels like we just arrived, on that hot night in July and now it’s already mid August and I’m sitting at our dining table, back home in Berlin. For some reason, my home city must have misunderstood the season, Berlin welcomed us with autumn weather, I had to pull out the wool pullovers from the far back of my wardrobe. To ease the pain, I keep looking at the hundreds of pictures I took during the past 4 weeks and I remember every single second that I see in the pictures. 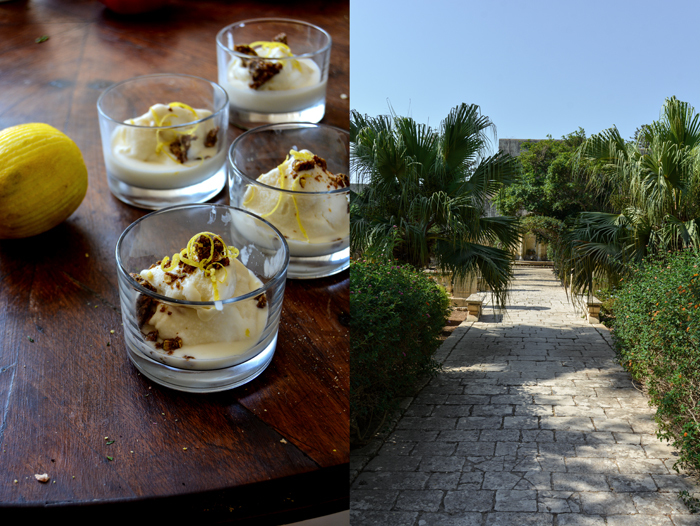 I can smell the salty air, I can feel the hot wind on my skin, and I can even taste the ice cream that Marina made for us when we met in the kitchen and gardens of Villa Bologna. 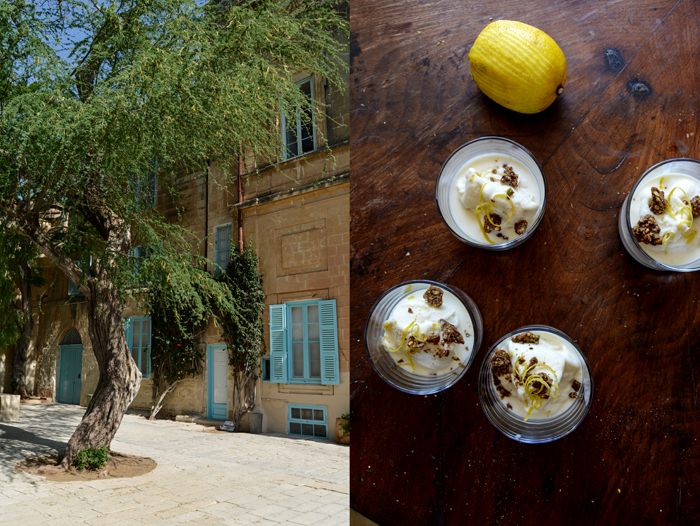 It was very lemony and it tasted so good – it was also the first recipe Marina ever made for me, back in the summer of 2015. This recipe is genius, it’s only made with lemon marmalade, heavy cream, milk, and the juice and zest of a Maltese lemon. We were so impatient, that she took it out of the ice cream machine as soon as the motor stopped. It was an early afternoon and so hot, that the ice cream started to melt as soon as we scooped it into the glasses. 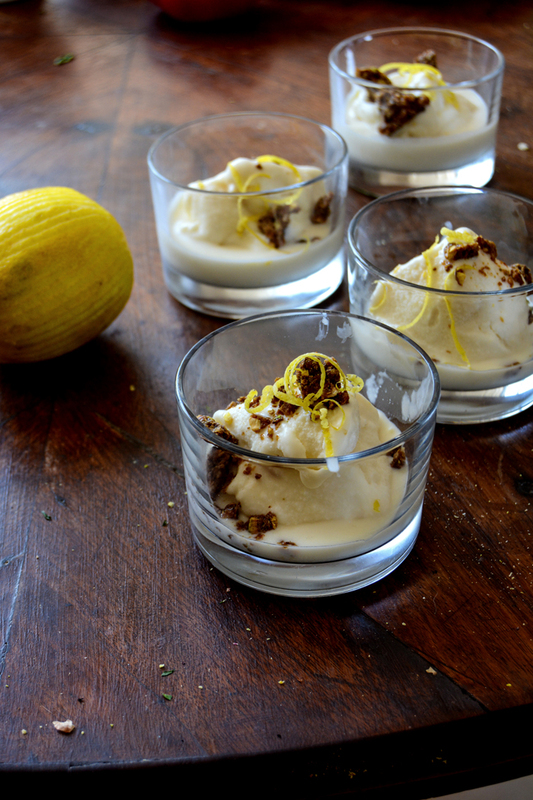 Marina topped it with caramelized pistachios and lemon zest and I can’t think of a better ice cream for summer – it was divine! Whenever I have to exchange my Malta life for my Berlin life again, I tend to get a little stressed during our last two days on the islands. There’s a lot of packing to do, but this time we had to sort out the transportation of 33 pounds (!) 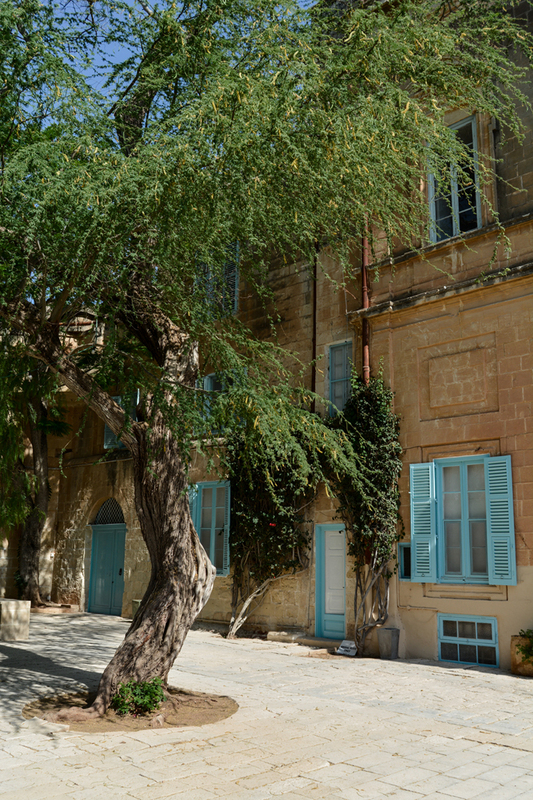 of sea salt from Mr Cini’s salt pans in Gozo – and we managed. I also had to put away numerous packages of ottijiet cookies from Busy Bee and there were many fragile shells collected from the bottom of the sea waiting to be brought to Berlin to find a place on our window sills. Although they are already covered in shells, I can’t stop collecting more and more of them. When the packing is done, we have a long goodbye ceremony with the family at our granny Edith’s house, accompanied by a few tears and food. And when we’ve waved the last goodbyes and I’ve finally gone through security at the airport, I usually feel exhausted. 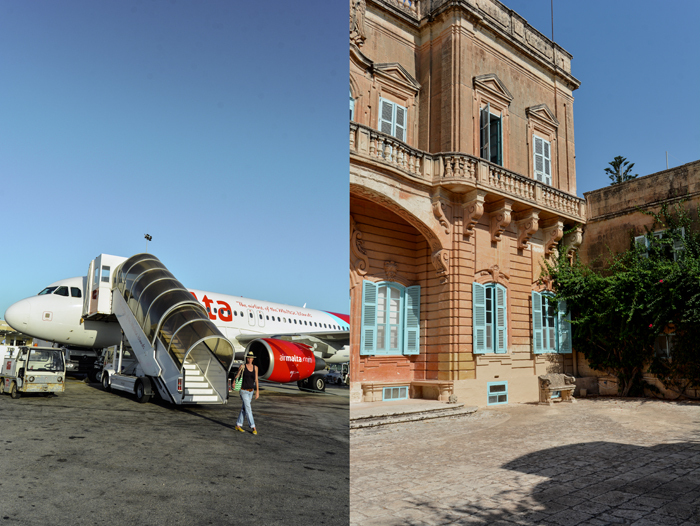 I just want to get on the plane and relax, which always works out perfectly, thanks to the country’s national airline, Air Malta. I love their cute looking planes, their friendly staff, and the fact that I don’t have to worry about the weight of my luggage. Everyone gets 20kg (44 pounds) for free, just like in the good old days of flying. And my last tip for the islands: I found a new old bakery in Rabat, they work traditionally and their baked goods are to die for! Makes about 1.5l / 6 cups of ice cream. For the ice cream, chill all the ingredients and churn in an ice cream machine until creamy. If it’s still too soft, keep it in the freezer until completely frozen. For the topping, add the sugar and pistachios to a frying pan and stir over low heat with a wooden spoon until melted. Quickly transfer the caramelized pistachios to a baking sheet and break into pieces when cool. 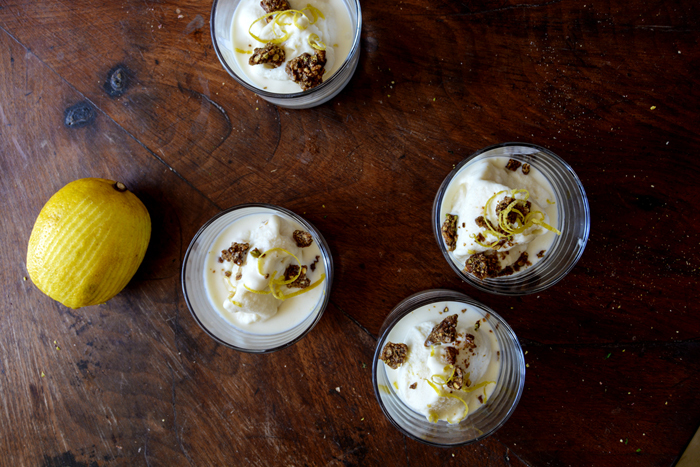 Divide the ice cream between bowls and sprinkle with caramelized pistachios and freshly grated lemon zest. I would love to try this devine treat, but I need the receipe for the lemon marmalade. Would you please provide it? This is great, you respond so quickly :-)!! I think this would be such a shame to spoil this homemade treat with something bought from the store and it kind of contradicts what I am trying to do here…, haha. P.S. ; Thanks and good luck with your attempts , too. That’s a great idea! Best of luck with your lemon marmalade recipe (I don’t think I’ll manage in the next few weeks) and let me know how it works out!! Pattie Rechtman told me about you. I hope you enjoy the blog. Please send my regards to Pattie!